Situated in the Central Market Arcade, Little Khmer Kitchen specialises in creating traditional Cambodian inspired street food. In keeping with the authentic street style, they offer takeaway and dine-in options ideal for a quick lunch stop or to take on-the-go. With a focus on combining efficient service with fresh, flavourful dishes, this unique addition to Adelaide’s bustling CBD is the perfect option for busy city workers and dwellers alike. Simple yet delicious, these tender turmeric infused chicken skewers were seasoned to perfection. Complemented by a fresh side salad and a generous serving of rice, this meal was refreshingly satisfying. This authentic national dish was a beautiful homage to its Cambodian heritage. 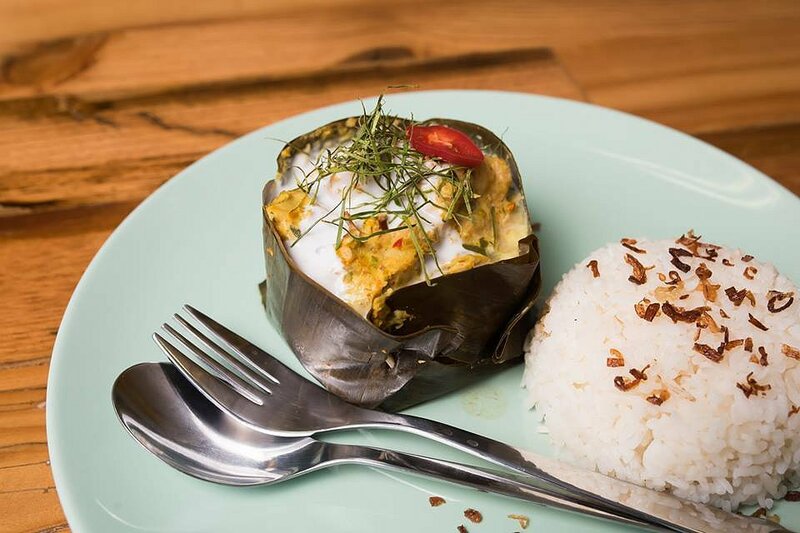 Served in a banana leaf bowl, this mildly spiced steamed fish curry was just as aesthetic as it was tasty. 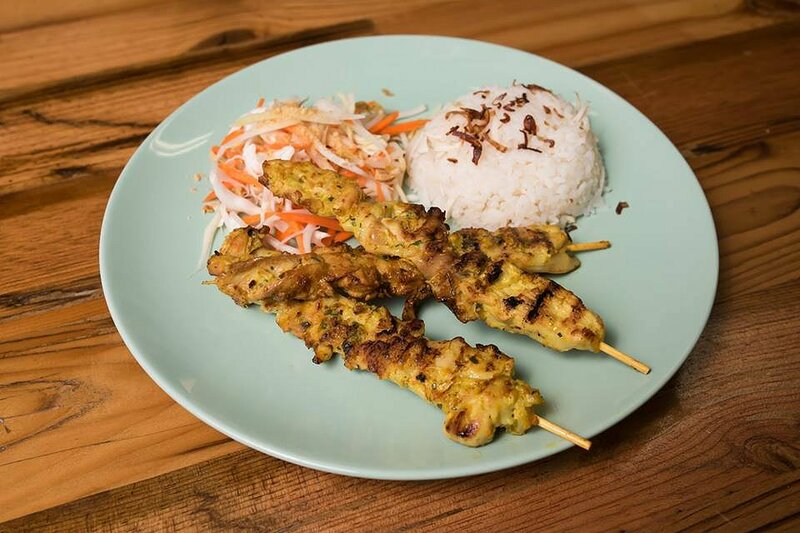 Seasoned with Khmer Kroeung spice paste and served alongside your choice of aromatic rice, this dish was a flavourful delight. Another traditional Cambodian dish, this caramelised braised pork stew was an intriguingly unique and enjoyable experience. 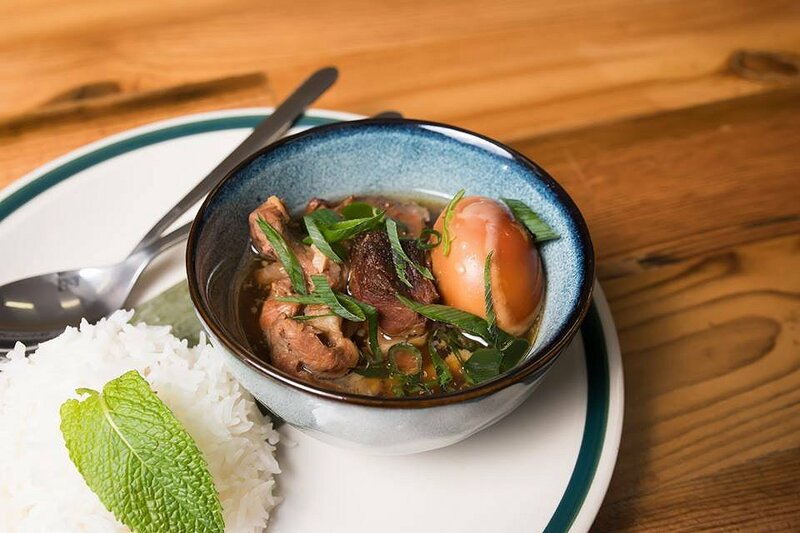 Cooked with Kampot pepper and served with a hard-boiled egg, this dish combined the delectably tender pork with a subtle sweetness of flavour. Accompanied by your choice of rice, this dish was thoroughly hearty and fulfilling. 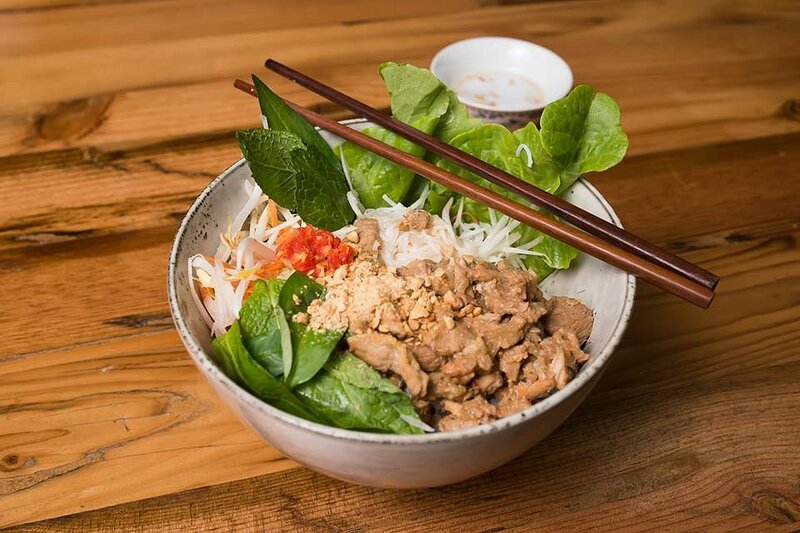 This refreshing salad was comprised of vermicelli noodles, green papaya, shredded cabbage and carrots and stir fried pork. Paired with a sweet and sour dressing and seasoned with chili flakes, this made for a refreshingly moreish blend of components. While combining the humble cold roll with a pancake may sound outlandish, it most certainly did not disappoint. 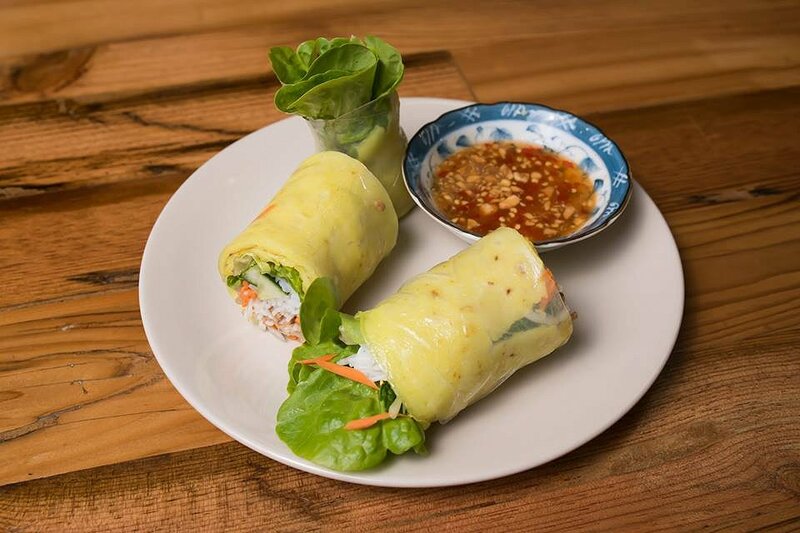 The use of classic ingredients such as noodles, greens, shredded vegetables and stir fried pork were only enhanced by the savoury pancake, which created a slightly denser, more fulfilling dish. 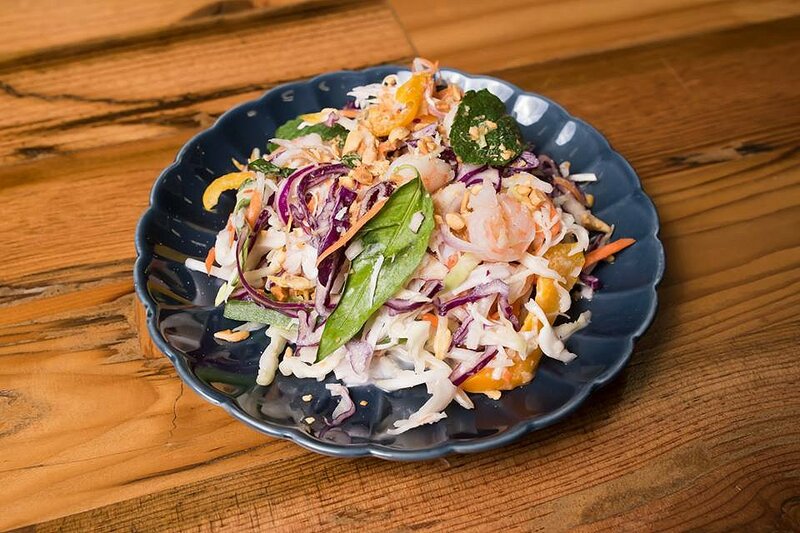 This mixture of noodles, seasonal vegetables and coconut built on the use of simple ingredients to craft a light, fresh salad. Drizzled with a sweet and sour dressing, and garnished with roasted peanuts, chili and coriander, this made for an enjoyable vegetarian option. 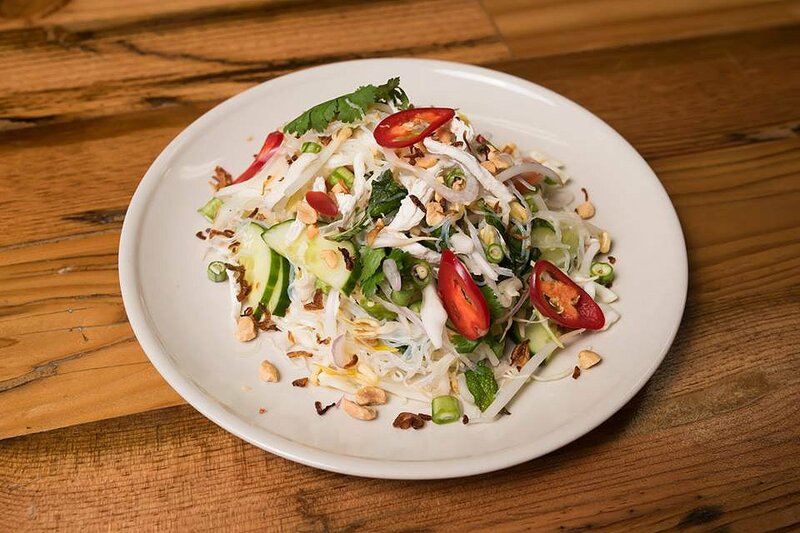 Similar to the previous dish, this salad incorporated the same ingredients but with the use of finer, bean-thread noodles. With the addition of both prawns and chicken this salad was slightly more substantial than the former, yet equally as pleasant. 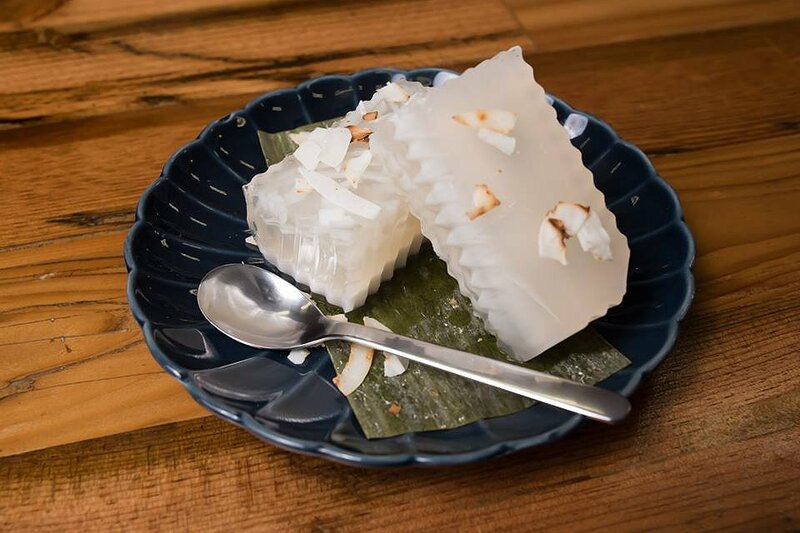 Infused with coconut essence, this agar agar jelly provided an unusually textured dessert. Topped with coconut shavings this mildly flavoured dish was certainly different, but flavoursome nonetheless. 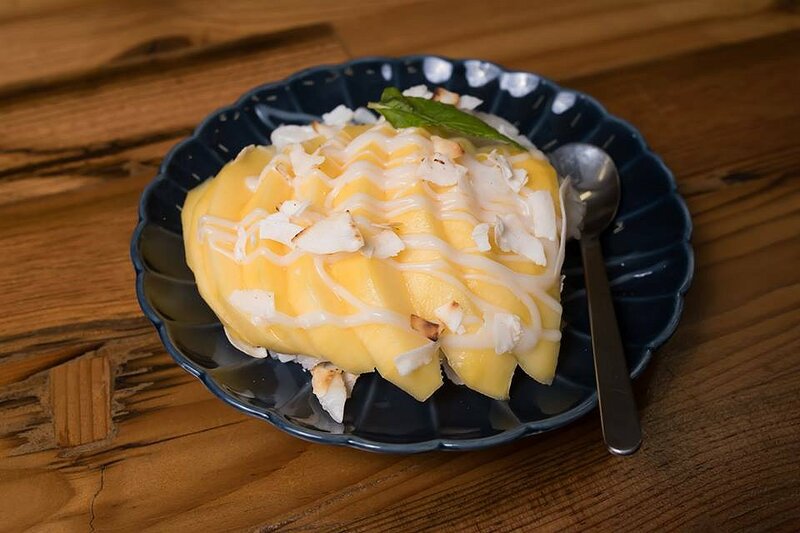 Deliciously creamy sticky rice topped with naturally sweet mango created a typically Cambodian flavour combination. Drizzled in a rich coconut syrup, this pairing of elements was a match made in heaven. With a broad selection of flavoursome options, Little Khmer Kitchen is a must-try on your next visit to the Central Markets. Their unprecedented focus on Cambodian street food is nothing short of delightful; this unique dining experience is sure to satisfy your cravings!